In this thoroughly engaging book Deirdre McCloskey puts the "dismal science" under the microscope. She offers advice to young economists, offering models from the old; and she lambastes the middle-aged who have allowed economics to become, as she puts it with characteristic verve, "a boys' game in a sandbox." McCloskey deploys her wit and style to serious purpose: to bring economics back to science. 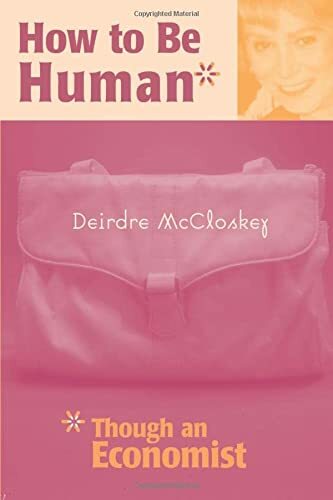 Anyone can learn about the field of economics from How to Be Human. She can learn how economics works as a discipline and as a piece of sociology, who the heroes are and the villains, how a career in economics relates to matters of ethics and epistemology. She can learn what it is like to be a new woman in a boys' subject, a subject that avoids at all costs the word "love." During the 1990s Deirdre McCloskey established herself as the main internal critic of the economic mainstream. Her quarterly columns in the Eastern Economic Journal, many of which are collected here, have become a handbook for reform. Trained in economics herself, she knows the normal science of the field from the inside: she has done it as a distinguished economic historian; and has watched it work from the faculties of Chicago (for twelve years) and Iowa (for nineteen), and now at the University of Illinois at Chicago. Her criticism from the inside is that the two methods on which economics has depended since the 1940s--existence-theorem mathematics and significance-testing statistics--are nonsense. They have, she claims, nothing to do with economic science, and have massively diverted economists from finding out how the economy works. McCloskey's book is written for anyone interested in economics, whether trained in it or not--anyone who cares about the economy but is not taken in by the boys' game. Deirdre McCloskey is University Professor of the Human Sciences, University of Illinois at Chicago.